So I decided to wear a dress to church today and since I haven’t worn a dress since around 2007, I had to go on a search for a pair of tights. Happily, I found a nice pair of black ones with no runs in them and thought,”Score!” I put them on and was surprised when they wouldn’t stay up. I thought, Finally! My Wii Fit workouts and point counting are finally paying off! Until I thought about it for a moment more. And realized that they were maternity tights. So last Friday was actually the Friday Feel Up. I forgot. I had an accompanying job and I’m a lousy multitasker. I’m sure all of us forget because we were doing something else. But it’s ok. Do your self breast exam today. I did. Because doing it late, is better than not doing it. 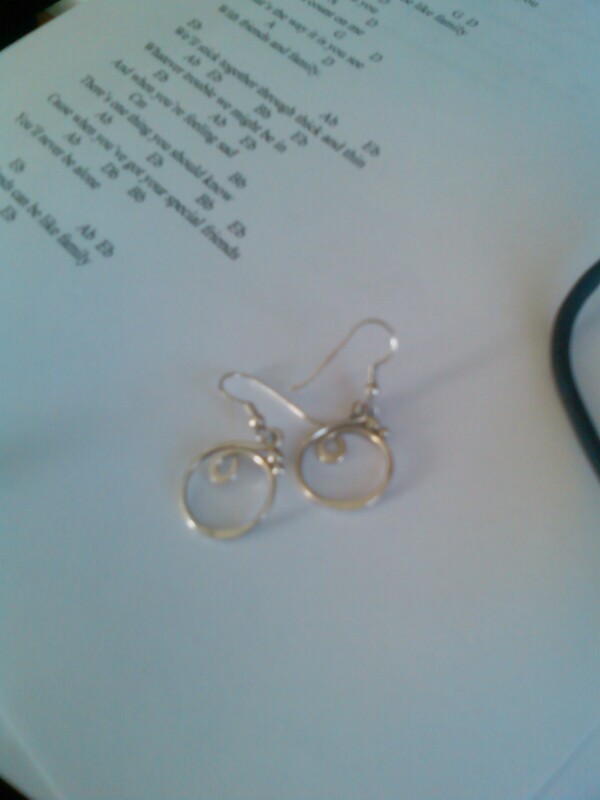 Actually, I spent yesterday cleaning my silver jewelry…with SCIENCE! Bear with me, the pictures are still from my cellphone. 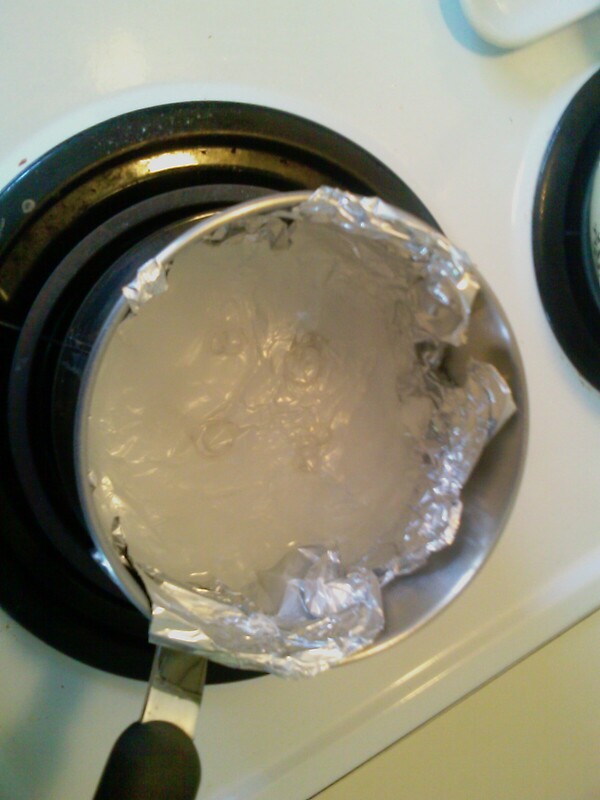 First, you line a small pot with aluminum foil. Throw a couple of tablespoons of baking soda in, fill the pot with about an inch of water (or however deep you need to cover your jewelry.) Bring it to a boil. I tried to take a picture of my silver so you could see how dirty it was. This was the best picture I could get. 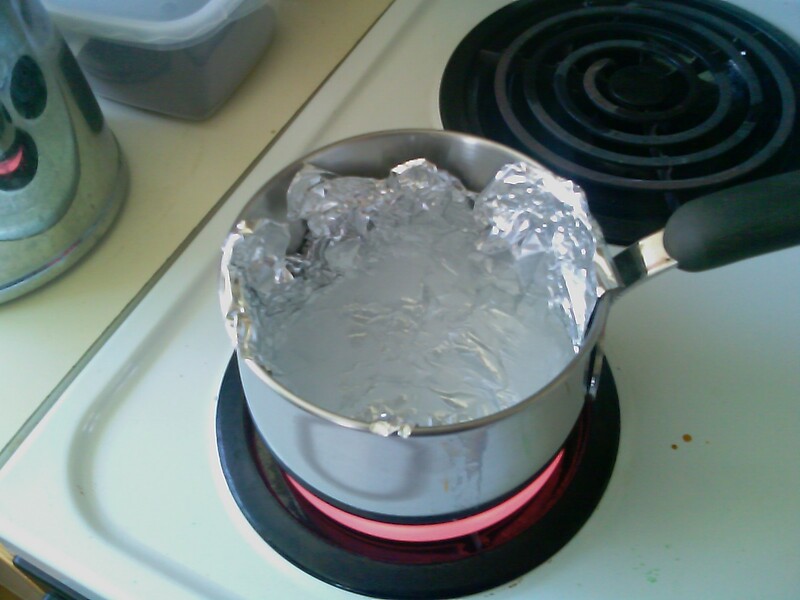 Once the water is boiling, take it off the heat and drop your jewelry in. Tarnished silver in the pot, nine days old... Um. Sorry. It works very well. Apparently tarnish is made up of sulfur (which you will smell) and sulfur likes to bond with aluminum more than it likes to bond with silver. Something like that anyway. All I know is my silver is nice and clean and I didn’t have to try and polish in those little tiny crevices. So here’s the best part of this cleaning method. It’s all stuff you have in your own home. It’s so easy even a lazy cook can do it. And you don’t have to use commercial silver cleaner (seriously toxic stuff). 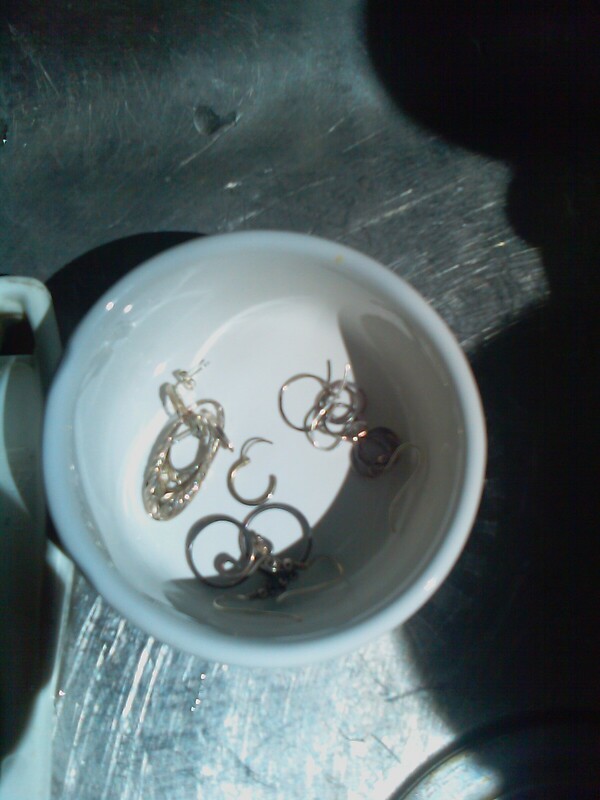 You will, however, need to rinse your jewelry unless you like wearing gritty earrings. Categories: It's not easy being green. I have a love/hate relationship with my Crockpot. 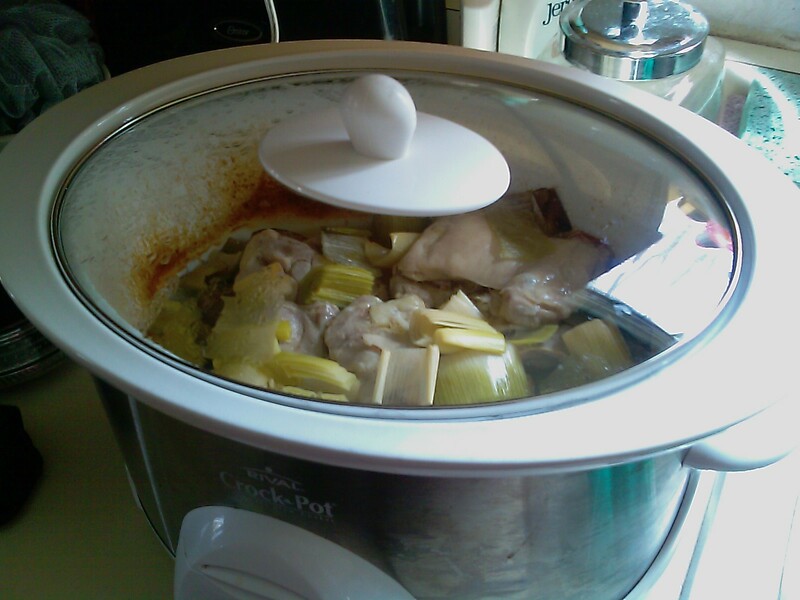 A friend of mine put it best when she said setting a Crockpot with a meal in the morning makes it feel like someone has come over and made dinner for you when you get home from work. Now I’m lucky enough to be a stay at home mom, but let me tell you, I feel the same way. I have one of those Crockpots that can make enough food for an army, and that you can set high or low for a specified amount of time. At the end it switches to low. I find my Crockpot runs really hot. I read over at A Year of Crockpotting that this might be because the pot is too big for the amount of food I’m making. I haven’t investigated this, but when I do, I’ll let you know what I discover. Anyhoo, I had a pretty busy week last week, two Planina concerts and an accompanying job, so the Crockpot was my buddy. I think I may have used it every day, mostly with success (Don’t do pasta. It just doesn’t work. Burns burns burns.). The favorite of the week, with me, husband and the kids was Chicken with tarragon and leeks from the Real Simple magazine. 3 of the recipes I made that week came from it. I love that magazine. But that’s another post. I did, however, make some lazy-cook-on-a-diet-and-a-budget substitutions. Instead of new potatoes, I cut up some russets I had here at home. Worked just fine. I found out at the last minute that my onions had rotted. Bummer. So I used a bag of frozen onion from King Soopers. I only used 2 leeks because they are crazy expensive. Fat free half and half instead of the heavy cream. I also used 16 oz of peas instead of 10 oz because that’s what I had and I didn’t want to put such a piddling amount back in the freezer. It was really good. Especially the fresh tarragon. Yum. Cables, cables and more cables. I’ve been working like a fiend on the Cable Yoke Maxi Dress from Lionbrand for my Mom. It’s had a few setbacks along the way. Some of my daughter’s hot pink silly putty (silly Mama bought it. *sigh*) found it’s way into my knitting bag and promptly stuck itself to the dress. Luckily most of it is on the inside. Next, I realized that people on chemo shouldn’t do cables. There were so many errors. 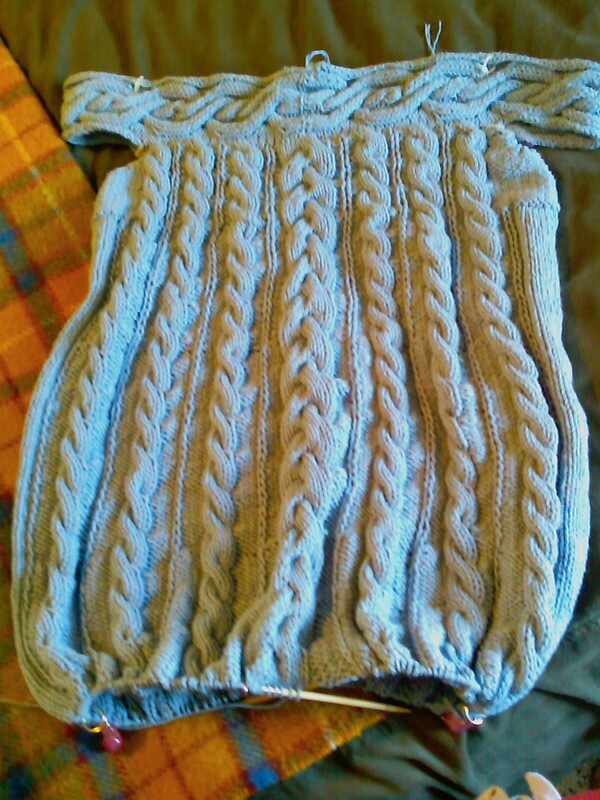 So I frogged it back to the yoke and decided, what the heck, I’ll knit the front and back in the round. There are still some, ahem, design choices along the way, but nothing as bad as some of the errors I had before. Mom’s coming in July and I’d like to have enough of it done to do a real fitting. Gotta get knitting. Heh. I’m so poetic. Apparently Sloppy Joes are a very American dish. 🙂 So for Mandy, here’s my Mom’s Sloppy Joe recipe. Slowly simmer. Watch closely as it will burn readily due to sugar. This can be refrigerated and then reheated. Serve on buns. Unless you are locked in a cave somewhere with no internet access or television, then you’ve watched this wonderful performance by Susan Boyle on Britain’s Got Talent. I love her performance. That song is freaky hard and even well trained singers struggle with it. What annoys me is the idea that the judges and the audience were so surprised she could sing. As if physical beauty has anything to do with musical ability. The idea that only people who look like fashion models should sing is a very new one. I blame MTV. I think video really did kill the radio star. Think about it. Think of all the music we would have missed out on today if they had been judged solely by their ability to sell clothing, perfume etc. All those Average Joe looking people with amazing talent. Billy Joel for one. Carol King. Elton John. So so many others. Journey. (Yes I’m showing my white suburban 70s and 80s upbringing). It makes me wonder who we’re missing out on now. Like Susan Boyle.